Like my #dangerous hashtag? Lately I’ve been finding all sorts of things that are #dangerous. S’mores Oreos, for one. The new coffee shop that is getting REALLY close to being completed in my library, for two. Seriously–I can see it from my office window. It’s like 30 steps away. I won’t even have to walk across campus! I see a lot of $3.80 caramel lattes in my future. [Yes, I have the price of a latte on campus memorized.] And this tasty treat, for three. Cause I love me some lemon meringue pie, but it’s kinda complicated. Crust, filling, meringue… all that jazz. And dishes, dishes, dishes! Now I can have all the taste with almost none of the work. #Dangerous, I say! 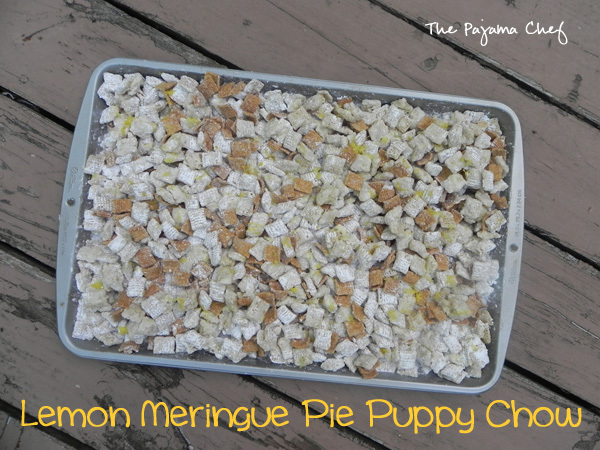 Lemon Meringue Pie Puppy Chow is sort of a random recipe to make at the end of August, I realize. This time of year is all about getting the last dose of summer in before pumpkin and apple season hits. But lemons are citrus fruits, and citrus fruits remind me of summer [even though they’re really a winter fruit, right? ], and lemons are sunshine-y yellow and happy! 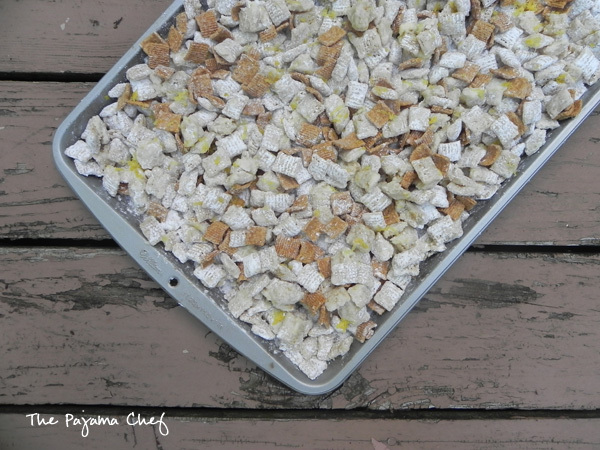 Plus, puppy chow is a no-bake treat… the perfect sweet that doesn’t heat up your kitchen. Score! 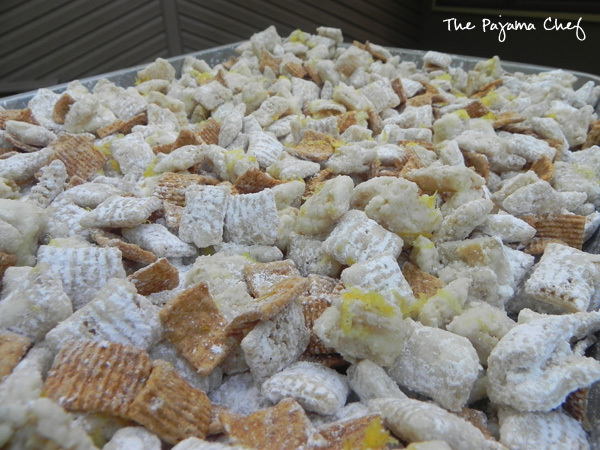 So this puppy chow totally makes sense. And is delicious. Did I say that yet? It’s sweet and tangy and sugary… an always addictive snack mix. This version has white chocolate in it too. Mmmm! Place Chex cereal in a large bowl. Combine white chocolate and butter/oil in a medium bowl and microwave on 50% power in 30 second increments until chocolate melts. Stir well between each round in the microwave. When chocolate is melted, add lemon zest then slowly pour in lemon juice, gently stirring to combine. If juice is too cold then the chocolate can start to seize up, so be careful. When combined, pour over Chex and fold together. Transfer mixture to a gallon size ziptop bag, then add 1 cup powdered sugar. Seal and shake to combine. Add an additional cup powdered sugar and repeat. If you want more powdered sugar in the mix or you want to fully coat the cereal, you may need to add more–another cup or so. Spread mixture on a large baking sheet or a piece of wax paper to allow chocolate to harden. When chocolate has set, mix in Golden Grahams/graham cracker pieces. 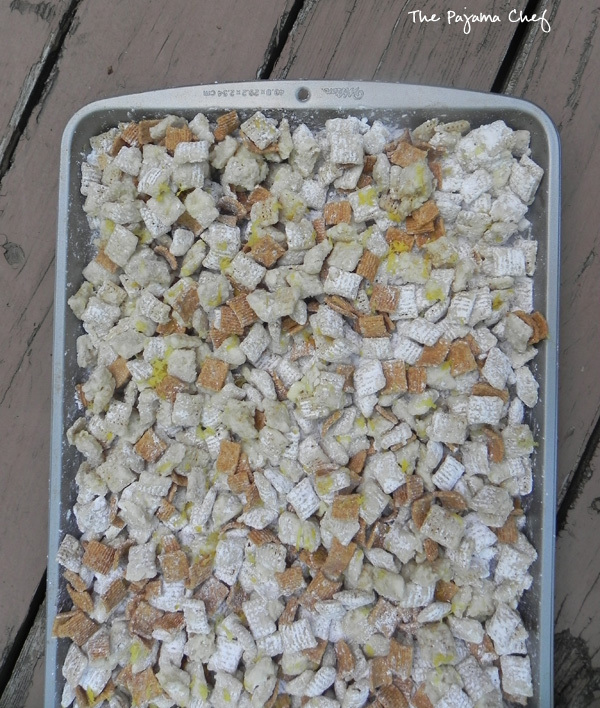 Note: Unlike regular puppy chow, this is best the day it is made… so it may not be a great recipe for making ahead. It’s definitely still edible [and enjoyable] for 4-5 days but because of the fresh lemon zest and juice you’ll want to eat it quickly. Andrea at Adventures in all Things Food, this month’s host, is giving away a copy of the book. * Enter to win a copy of the cookbook so you can join us in future months, if you wish! One of our lucky readers – US and Canada only! 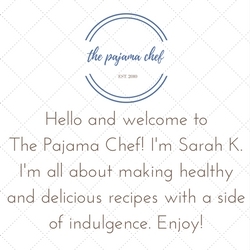 – can enter to win a copy ofThe Book Club Cookbook, Revised Edition: Recipes and Food for Thought from Your Book Club’s Favorite Books and Authors by Judy Gelman and Vicki Levy Krupp, courtesy of Tarcher-Penguin. Giveaway runs from August 1st till August 31st at 6 o’clock PM, Pacific time. Please see terms and conditions in the rafflecopter widget below. Many thanks to Tarcher Books. 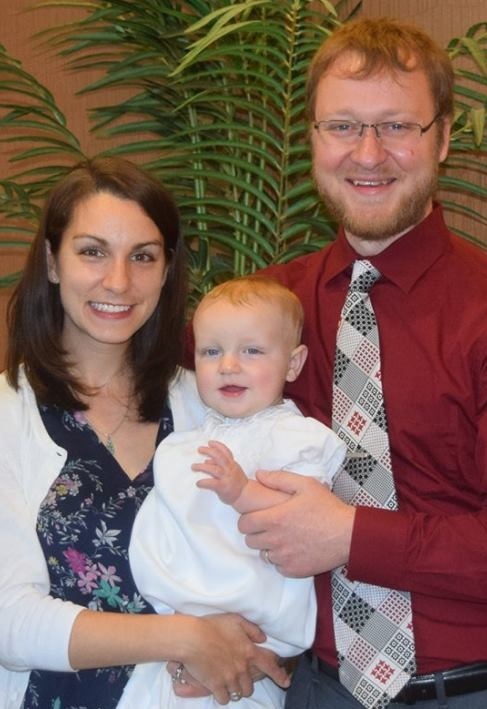 You may find Tarcher: on the web, on Facebook, on Twitter, and on Pinterest. Enter the giveaway at the link below! *Disclosure: Andrea received a complimentary copy of The Book Club Cookbook, Revised Edition: Recipes and Food for Thought from Your Book Club’s Favorite Books and Authors by Judy Gelman and Vicki Levy Krupp to use in this year-long project plus the opportunity to give a copy away. Opinions are our own. We received no further compensation for our posts. 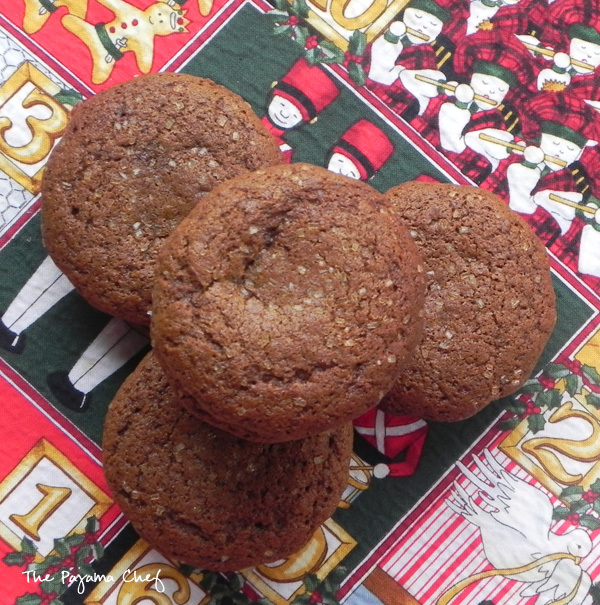 The warm, spicy flavor of gingerbread in a muffin, instead of fussy cookies. 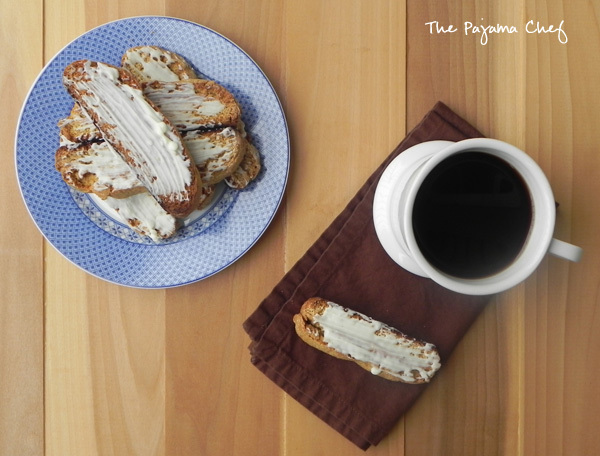 Perfect for breakfast, teatime, or anytime! I always love a good muffin, and these were no exception. They come together in just a few minutes in one bowl for easy cleanup… and smell absolutely amazing as they bake! We put up our tree on Friday and let me tell you, I should have made them while we were decorating. 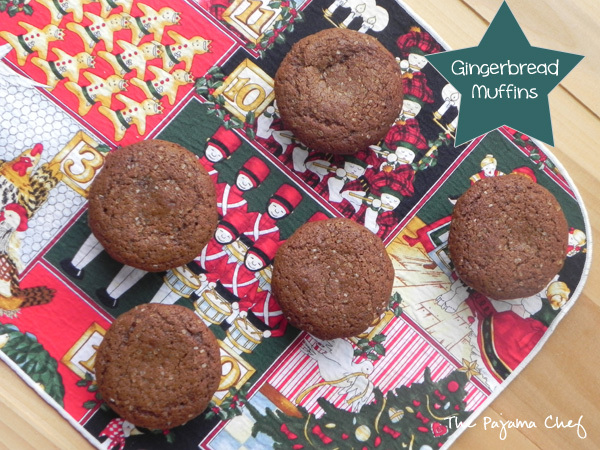 These muffins can compete with a gingerbread candle for best smell ever. I actually have a gingerbread candle, so I should do a test run. Haha. But as for taste, I think muffins win over candles any day! 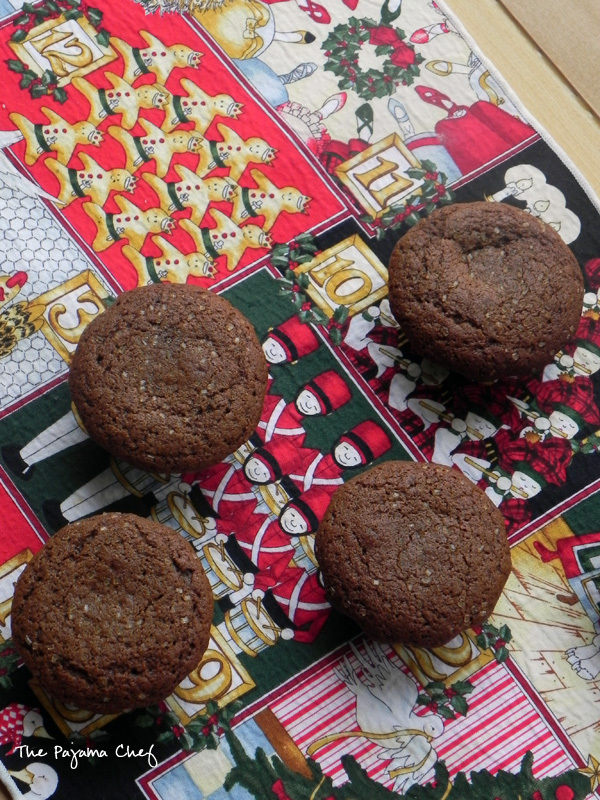 They’re perfect to make on a cold afternoon during the holiday season. If you like, you can add white chocolate chips like Jessie did. I’m sure they’re great that way too. Enjoy! Preheat oven to 350 degrees F. Line a muffin tin with paper liners or spray well with cooking spray. In a large bowl, whisk together flour, cocoa powder, ginger, baking soda, and sugar. In a measuring cup, whisk together oil, molasses, milk, and eggs. Pour wet ingredients into dry and stir until just mixed. Fold in white chocolate chips, if using, then divide batter between muffin cups, about 2/3 way full. Bake for 25 minutes, or until toothpick comes out clean when inserted in the middle. Linked up with Weekend Potluck. 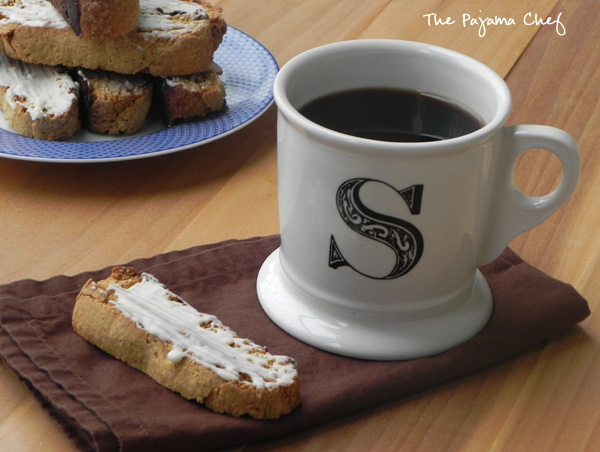 Crunchy, pumpkin spiced biscotti make a crisp fall morning extra special! I first started drinking coffee eight years ago in a little corner café in Nice with ornate velvet chairs, marble tables, and the most divine pastries you have ever seen in your life. Iiiiii know. It’s as idyllic as it sounds–this is France we’re talking about, after all. The cafés in Paris did not even BEGIN to compare. This little spot is a slice of heaven on earth. I remember luxurious mornings on that summer project with Cru, sitting and reading and talking in that café with a big green awning, wishing that summer would never ever end. But it did, and I came home, and US coffee is nothing like that strong French brew, especially when said brew is layered with cream and thick caramel. Mmmmmm! I gradually journeyed from occasional fancy, caramel-y coffee drinks to an everyday coffee habit with a constant rotation of Paramount Coffee in our cupboard [no sponsor or anything, we just really like their coffee]. One thing I never understood was biscotti. 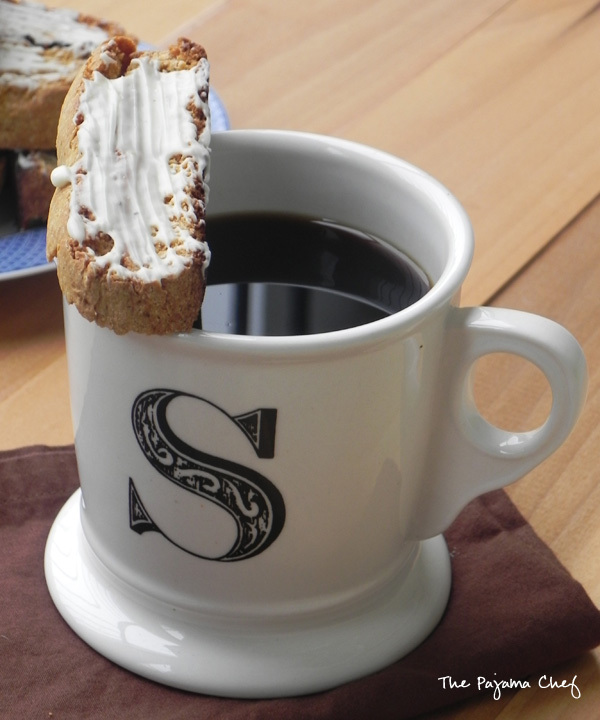 The concept of biscotti–cookies at breakfast–totally makes sense. But a hard cookie? That you dip in coffee? Well, that just sounds weird. I’ve never been a dip-my-Oreos-in-my-milk kinda girl. Crumbs=gross. The only biscotti I’ve ever had just was… boring and tasteless. And let’s face it–I probably tried to bite into it without enough dunking. Ooops? 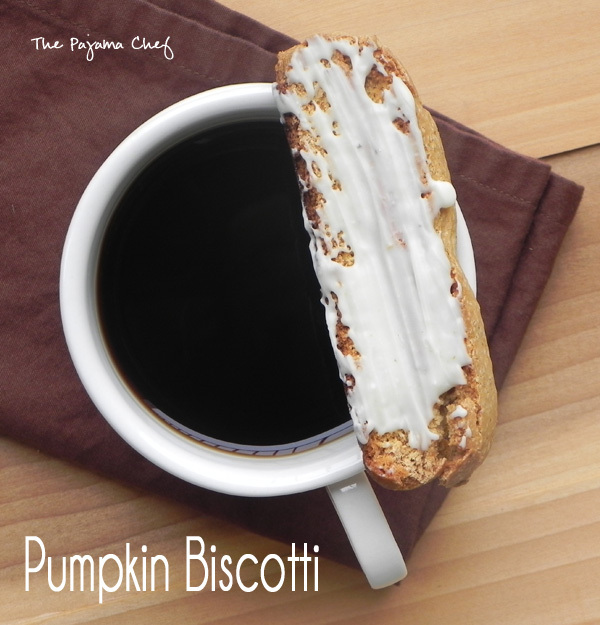 Though I made these biscotti for #PumpkinWeek [it ends tomorrow! Tear!] they also fulfill one of my 30 before 30 goals. Yay! Thanks to Terri from Love and Confections for hosting. You can also find these great recipes and more on Love and Confections’ #PumpkinWeek Pinterest Board! If using nuts, melt butter in a large skillet set over medium heat. Add nuts and stir to coat. Cook nuts, stirring constantly, until they brown. Remove from heat and cool completely before proceeding. Preheat oven to 350 F. Line a baking sheet with parchment paper or a silpat. With a mixer, beat together eggs, brown sugar, pumpkin, and vanilla until the mixture thickens. With mixer on low, slowly add flour, baking powder, and pumpkin pie spice. Dough will be thick so just mix it in a little with the mixer and then finish up by hand. If using nuts, fold in at the end. Dough will be crumbly. Divide the dough in half, then shape each half into a 3×10 inch log. Place on prepared baking sheet, then wet hands and smooth logs if necessary. Bake until the logs are slightly firm to the touch, about 25-30 minutes. I found that without nuts, my logs didn’t firm up at all until about 35-40 minutes, but they do firm up more as they cool so go with your instincts. Cool on the baking sheet for 15 minutes, then remove to a cutting board and slice with a serrated bread knife. I got about 12 slices by cutting my pieces about 1/2-3/4 inch thick. Return cookies to baking sheets, cut sides up. Place in a single layer and bake until firm, about 20 minutes, flipping halfway. Remove to wire rack to cool completely. Once biscotti have cooled, melt white chocolate and oil together in a microwave safe bowl, heating on 50% power in 30 second bursts, stirring in between to melt. Drizzle, brush, or dip with white chocolate. Store biscotti in airtight container. It’s best within the first four days, but will keep for 3-4 weeks.